What Is The Uber Driver Sign-Up Bonus? Nowadays it seems like everyone knows at least one person who is a driving partner with Uber. The word “Uber” has quickly become a household name, almost neck and neck with saying “Google it.” My friend is a driving partner with Uber, and my friend’s parents are as well. 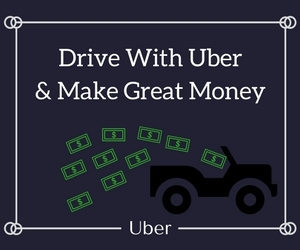 Many people are looking for ways to make a little extra cash, so becoming a driving partner with Uber is an ideal way to generate passive income. The main attraction, of course, is the flexibility of being able to work when you want to and as often (or not) as you’d like. In the ridesharing industry, there is no one breathing down your neck because you are your own boss. In other words, your dress code, work hours and availability, and overall success in the ridesharing industry are completely up to you. For some, this may just be the greatest thing since sliced bread. What makes Uber really unique, though, is that the company prefers to designate drivers as “partners,” not “employees.” Uber completely shifts gears when it comes to the traditional employer-employee mindset; instead, Uber establishes partnerships with their drivers, providing attractive perks to drivers along the way. Of course, if you know someone who’s already a driving partner with Uber, you probably have caught wind of one of these popular perks: a new driver sign-up bonus. Let me take a few minutes to explain what Uber’s sign-up bonus entails for new drivers, and why it really does live up to the hype. Uber is trying to dominate the ridesharing industry, especially when it comes to peer-to-peer transportation services. However, Uber isn’t just competing against the taxi industry. They’re competing against the automobile industry overall, shaping the future of transportation as we know it (along with how many people actually own vehicles) at full throttle. In order to squash the competition, Uber must assemble a massive fleet of driving partners. This is where the driver sign-up bonus comes into play. Keeping this mission in mind, Uber offers double-sided referral bonuses to both new and current drivers. It’s a win-win situation, really. The sign-up bonus can range anywhere from $25 to over $1,000 for signing up as a driving partner with Uber. Sign-up bonuses do vary from city to city, which is the reason why bonuses can drastically differ in amount. When I first signed up I used my friend’s referral code. The bonus was $300 for both of us. So, in total, Uber paid out $600 ($300 for me and $300 for my friend) just for me to basically check out Uber and see if ridesharing was right for me. It’s been a year and a half now since that moment, and I’m proud to say I’m still a dedicated driving partner with Uber. So, I guess it really couldn’t be as bad as people make it out to be. However, don’t take my word for it. Make sure to check out how easy it is to earn a new driver sign-up bonus below. Who knows, you may just be the next person to cash in on this great perk. Sign up through this link, or use my unique referral code: 41hh6ue. Be sure to upload all necessary documentation and agree to a background check (part of the approval process). In order to earn your bonus, you are required to complete a certain amount of trips for Uber. It can range anywhere from taking 10 trips to taking 100 trips. Uber will let you know when you sign up, and you’ll also be informed of your sign-up bonus amount. Once you have completed the required trips in your city, Uber will pay you the specified referral bonus on your following paycheck (Uber pays weekly). Currently, if you are in the San Francisco Bay Area, Uber is offering $700 for completing 100 trips. A few months after I signed up, Uber offered $600 for taking 20 trips for new drivers. I had my friend take advantage of the offer. Uber paid out $1,200 between my friend and me because he took the 20 trips required. As you can see earning a new driver sign-up bonus does take some effort on your part, but seeing the extra funds deposited into your bank account is more than worth it! The cool thing about Uber is if you already signed up as a driving partner but forgot to use a referral code, there is still a chance for you to redeem a sign-up bonus. You can get a sign-up bonus by retroactively applying the Uber referral code. You only have 15 days after you’re activated to drive to initiate the retroactive referral bonus process. You can send Uber a message letting them know you forgot to enter my referral code (41hh66ue) and wanted to confirm what your sign-up bonus would be. You can send an inquiry by going online here. Of course, if you don’t get a response after a few hours, you can always send a message through the partner app as well. Once logged into the partner app, navigate to Account-> Help-> Payments and Rewards-> Driver Referrals -> Report a Missing Driver Referral. They may also ask for the phone number of the referrer. Just send me an email titled “Retroactive Referral.” This way I’ll understand what the email is for. I don’t want to leave my phone number posted here for everyone to see. Is the Bonus Always the Same for New Drivers and the Referring Drivers? While this has always seemed to be true for San Francisco, it seems there are plenty of cities where referring drivers will get offered more than the new drivers. It would be ideal to have the bonuses be the same for both new and current drivers, but this doesn’t mean the bonus isn’t worth signing up for, though. Is Uber’s Bonus the Same Amount Every Month? No, they are not. Sometimes they are higher, sometimes they are lower. Eventually Uber will have to stop handing out bonuses since the company’s been handing out money like candy over the last few years. If you haven’t taken advantage of the sign-up bonuses yet, now may be the time to do so before you lose out. Where Can You Get the Biggest Bonus? The driver bonus is tied to each participating city, so it doesn’t really matter whose referral code you use in the whole scheme of things. The amount won’t change in your city, so you don’t need to worry about that. Will I Make Bank Being a Driving Partner with Uber? In reality, every market is different and operates differently. The average driver can make $15-$25 an hour before factoring in expenses. For the most part, the sign-up bonus is enough for you to sufficiently get your feet wet. Then, you can form your own opinion on the ridesharing industry, and whether becoming a driving partner with Uber is the right move for you. If you have any other questions, please feel free to leave a comment below!